Dotwork is an intricate style of tattoo that is becoming more and more popular. Here you’ll discover everything you need to know about dotwork tattoos. Tattoos are becoming more popular than ever. They serve as a form of self-expression, a memorial, or even just a collector’s hobby. In the past, society viewed them as something only military service members, criminals, or gang members would have put on their body. Today, you most likely know someone who has at least one tattoo. Celebrities also play a role in this cultural shift. Stars such as Adam Levine, Dwayne Jonson, and David Beckham have made getting inked more acceptable for the general public. To put it into perspective, the industry was worth $2.3 billion in 2012. But, people are beginning to explore dotwork tattoos along with traditional ones. They’ve become an increasingly popular trend that people are flocking to, and customers seem to love their results. Read on to learn everything you should know before you look into getting a dotwork tattoo. So, What Are Dotwork Tattoos? Like the name implies, dotwork tattoos are images composed entirely of single dots. As you may expect, this process can take a long time to complete. Artists typically use black and gray, as well. But, this doesn’t mean that color isn’t an option. Dark blue is used fairly often, but brighter colors are less common. Throughout history, dotwork tattoos have traditionally been used for religious or cultural artwork. This is especially true in Asian and European countries. In fact, they have been around for thousands of years. Today, dotwork has reemerged as a trend due to the way the artwork looks when completed. Compared to conventional tattooing methods, dotwork ink tends to come out smoother. When closely examined, this type of tattooing (as you can tell from the name) also allows you to see each individual dot. This gives the artwork more character. 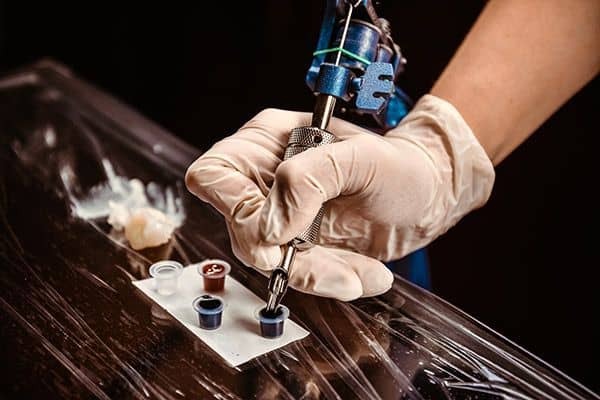 People tend to have different levels of pain tolerance when it comes to getting inked. More often than not, however, getting a tattoo is going to hurt. The location of the ink heavily determines how bad the pain will be. The ribs, inner arms, and shoulder tend to be the most painful. Those who have dotwork ink done often say that the pain is more localized to where the dot itself is. With regular tattoos, the pain may sometimes radiate throughout the entire area. Does dotwork hurt less? It’s hard to say because neither type of procedure is particularly comfortable. The major difference is the length of time it takes the artist to complete the work. Dotwork takes more time, which means that you will experience discomfort for a longer period. The most interesting thing about this type of tattoo work is how it is done. While an artist can do dotwork pieces with a regular tattoo machine, many artists tend to use hand poking techniques. Hand poking the ink into the skin allows the artist to be far more precise with their work. It is also easy to tell this type of tattoo from a traditional one because of the process. Those who have hand poked tattoos frequently describe a high level of satisfaction with the work because it feels more organic to them. It’s no secret that tattoos can be expensive. Some artists charge based upon the entire piece, while others will want to be compensated by the hour. Dotwork ink takes longer to complete than regular ink. Therefore, the price will most likely be higher than a similar piece that an artist does conventionally. But, the price hasn’t done much to stop people who are set on getting the ink they want. While dotwork may demand more money and time, the results (from a talented artist) are worth it. What Type of Art is Best? There aren’t many hard limits on the type of art your artist can do with dotwork. However, the most common subject matter for a tattoo artist to work with seems to be symbols. These could be mandalas, geometric style tattoos, or even something minimalist. Generally, though, the less complicated artwork is the best option. You’re going to have a very hard time finding an artist skilled enough for (or who would even want to do) a photorealistic dotwork piece. As long as you’re willing to go through the extra pain, almost any type of artwork is possible. Dotwork tattoos have a unique appearance, but the concept for them does not have to be unusual. While the procedure for a dotwork tattoo may be a bit different than normal, the aftercare is the same. After all, the ink ends up in the same place: underneath your skin. It’s just deposited in another way. As long as you keep your ink moisturized and covered for the appropriate amount of time, it should heal just as normally as a regular tattoo. You don’t have to have an entire piece made completely out of dotwork. In regular tattoo art, dotwork is often used for shading. In pieces that are primarily black and gray, it’s not uncommon at all for an artist to finish up with this method. Not all dotwork shading is conventional. To save time, artists may use certain types of tattoo machines that emulate the effects of hand-poked dotwork tattoos. When an artist uses this type of shading, it creates a smooth, almost foggy appearance to the areas where the artist utilizes it. How Do I Know if I Should Get a Dotwork Tattoo? There aren’t tattoos that you can do with only dotwork. But, dotwork can make certain pieces appear softer and more natural. If you are willing to go through what hand poked dotwork pieces take, then you should do so. Of course, make sure you find a reliable, professional tattoo artist to take care of you. Once you’ve decided what tattoo you want and where you want it, research different shops and find a skilled artist that you resonate with.